Score one for the home team with our easy pudding-and-cookie dessert. Red licorice makes easy seams on this big-league-worthy ball. Uncover dessert. Invert onto serving plate; remove plastic wrap. Frost dessert with COOL WHIP. Cut remaining cookies in half; arrange around edge of dessert. Cut licorice into 2 (8-inch) pieces and 20 (1-inch) pieces. 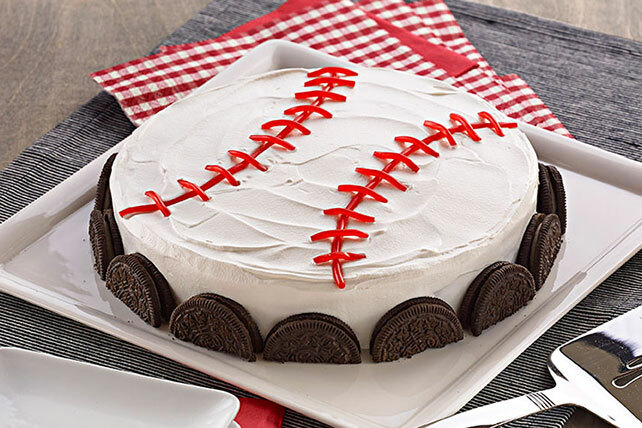 Use licorice to decorate top of dessert to resemble a baseball. To easily line pan with plastic wrap, first spray pan lightly with cooking spray. The plastic wrap with stick to the pan instead of moving around when layering the dessert. To easily cut OREO Cookies in half, refrigerate them first for about 15 min. Then, use a serrated knife to cut them in half.